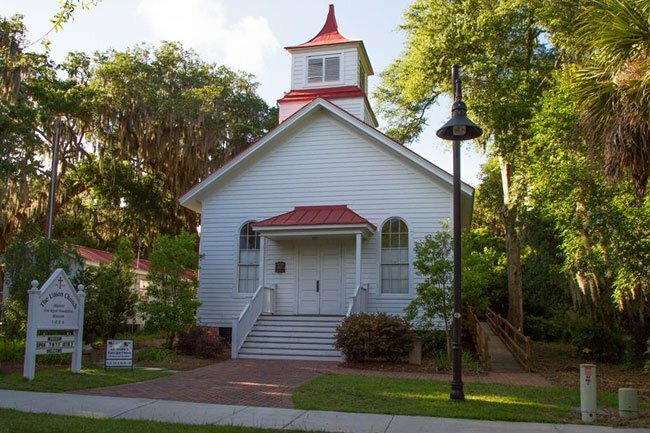 This historic church building in Port Royal is the result of racial strife in the Beaufort County community following the Civil War. When Federal troops occupied Port Royal in 1861, white plantation owners evacuated, leaving their properties behind. The government seized the plantations and enacted the Port Royal Experiment, a government program that trained newly-freed slaves to manage the land abandoned by plantation owners. Following the war, many former plantation owners returned to Port Royal only to find that their land had been sold by the government to their former slaves as well as to Northerners who sought speculation opportunities in the South. Upon that discovery, tensions surged among white Southerners, white Northerners, and African-Americans. Despite the fact that there was at least one black church in Port Royal active during Reconstruction, as well as St. Helena’s Brick Baptist Church – which served both blacks and whites – many of the local whites insisted that “Port Royal … cannot claim to be a city unless she boasts of at least one place of worship.” On April 16, 1877 a committee was formally organized to establish a church for whites, and Daniel Appleton donated the present lot on which the church was built in 1878. It was originally called the Free Church of Port Royal and was nondenominational. The members of the Free Church of Port Royal continued to be primarily, if not solely, white well until the twentieth century. The church’s trustees changed its name to Union Church in the 1920s to reflect its nondenominational status. However, from the 1960s through the 1980s the church was used by various denominations at different times and was called The 11th Street Tabernacle in the 1970s and 1980s. The Town of Port Royal purchased the church in 1994 for ten dollars and converted it into a community center and theater. Today it is owned by the Historic Port Royal Foundation and serves as its headquarters. The foundation established and maintains a museum within the building, and docent-guided tours are offered Tuesdays through Fridays. The building was restored in 2004 and is also the home of St. Mark’s Episcopal Church, which meets in the building for worship each Sunday morning. The Union Church of Port Royal is significant in vernacular church architecture as a rare and intact example from the Reconstruction era, and in social history as an institution that illustrates the changing social landscape of Port Royal, Beaufort District, and the South Carolina lowcountry during the Civil War, Reconstruction, and into the twentieth century. Conceived of in 1877 as the Free Church of Port Royal by local white residents desperate for a house of worship, and completed in 1878 following a subscription fundraising scheme that was interrupted by a devastating outbreak of yellow fever, the church represented the collective efforts of the rural Port Royal community to erect a church that could be shared by all white denominations in the village. Built with donated lumber and erected by local residents, the church’s design reflects the simplicity of local craftsmanship, the recurring architectural details of other local buildings from the period, and an awareness of national architectural styles. Union Church of Port Royal also serves as an emblem of the landmark Port Royal Experiment and the resultant social upheaval that characterized this part of South Carolina from 1861 to 1877, as well as the ongoing de facto segregation that was so prevalent in the South from 1877 until the 1960s.